Benestar, formerly Davidson Trahaire Corpsych (DTC) is a leading employee well-being services provider in Australia, New Zealand and Asia. 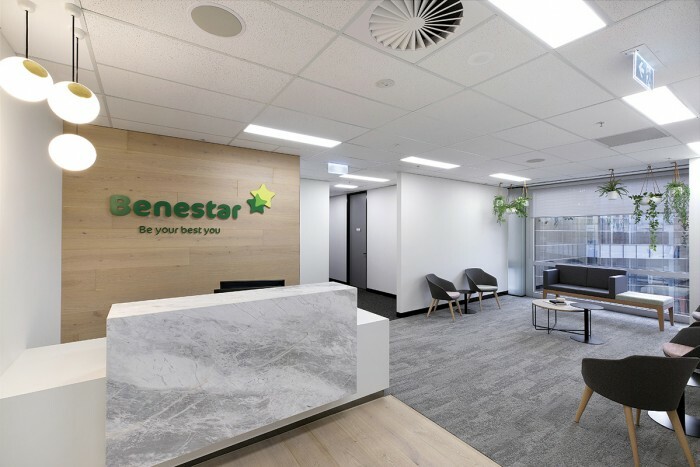 Having recently undergone a complete national rebranding of their company, Benestar appointed ODC Design to create a new office space in Melbourne which suited their objectives of a new business profile and future company expansion. The prerequisite of the brief was to establish separate client consulting rooms from the staff back of house area. This was achieved by redesigning the consulting rooms to be located alongside the reception and waiting areas which would allow for effortless accessibility to the Benestar client. The back of house area includes workstations, staff breakout, facilities and quiet rooms with an adjoining door to the corridor of the consulting rooms. Various natural materials were used in combination with an organic colour palette which included timber panels and flooring, reception desk featuring CDK stone marble, seating fabric, frosted film graphics to reflect the new corporate colours and the introduction of hanging plants.